You’ll be pleased to hear that Ade completed his mission of growing all the veg for our Christmas dinner. In fact, he really surpassed himself. 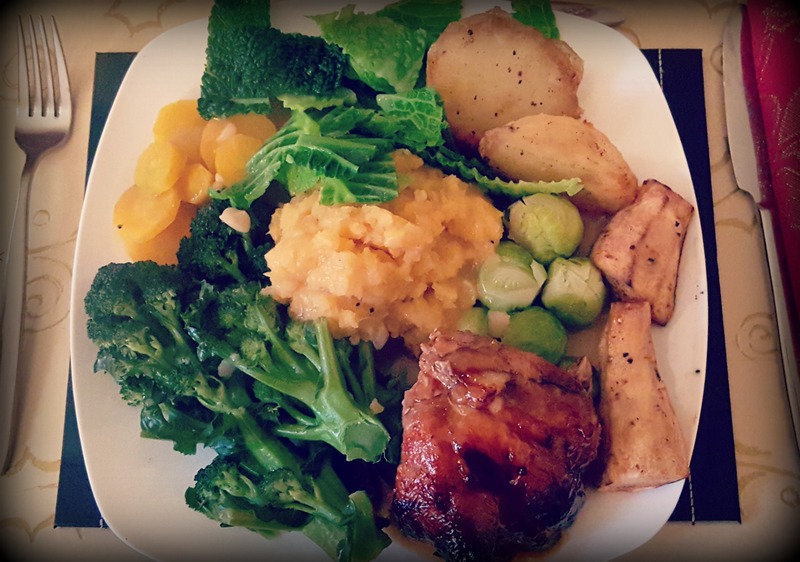 The roasted duck almost paled into insignificance beside the delicious cabbage, sprouts, carrots, swede, parsnips, broccoli and roast potatoes which Ade grew for us. We feasted well, my friends! And hopefully you did too. But now the holidays are over, the decorations are down and it’s back to normality again. While Ade is planning his allotment planting for the coming year, I’m busy in the kitchen, working on new recipes for our current supply of veggies and looking forward to the harvests to come. Previous Happy New Year 2016! Looks delicious. What a great way to celebrate and enjoy the fruits (and roots) of your efforts. I’m almost inspired to set a similar goal myself, but I can’t imagine a holiday meal without potatoes and I can’t seem to grow them worth a hoot. Maybe in 2016? No point gardening if I’m not pushing my limits. It’s a great challenge, give it a go! Struggling with potatoes? Have you tried growing them in sacks? That’s how we first started growing them and it was nice and easy. Looks utterly delicious! And how satisfying that so much of your Christmas dinner came from your own garden.